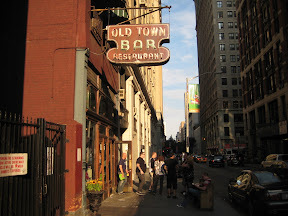 Old Town Bar – Who You Callin’ A Turkey??!? I wasn’t all that impressed with the burger and I had not planned on returning for a burger. However when my business partners Mark and John, chose it as our pre–Roadrunner Records Holiday party meeting location, the chances became more likely. After skimming the menu, I decided to get a try out their turkey burger with American cheese and roasted onions. Old Town claims the burger is made with their “blend of onions and herbs” and that sounded pretty good to me. 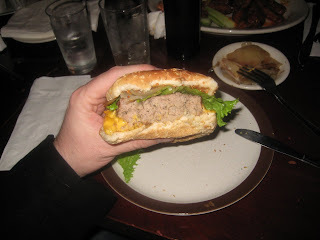 The burger comes on a nice and sturdy but not hard sesame seed roll that amply fits the burger with out overpowering. The spice blend was subtle but definitely made the difference in the taste here. The burger was absolutely covered in American cheese which actually worked to accompany nicely. The roasted onions were sweet in nature and made for a nice compliment to the overall sandwich. Next time I go back, I am getting this again. 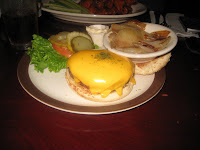 This entry was posted in Bar, Burgers, New York and tagged bar, best burger, best burgers in nyc, burger blog, burger club, burger conquest, cheese, ciancio, david, french fries, gourmet burger, great burger, hamburger, nyc, old town bar, restaurant, rev, review, turkey burger. Bookmark the permalink.